The Andrea Series offers a large selection of tubs with a simplistic, straightforward design. The modern rim allows for drop-in or undermount installation and with the the Andrea 10, Andrea 24 or any Sculpted Finish - a freestanding tub. Once your tub is ordered, it is created especially for you at MTI's plant in Sugar Hill, GA. After passing their highest standard of excellence, it is shipped directly to you. No refurbished, reconditioned tubs are allowed. Fully warrantied by MTI. And your tub only makes one trip - from the manufacturer to you. The tubs are listed by size: first by length, then by width, then by height - smallest to largest. 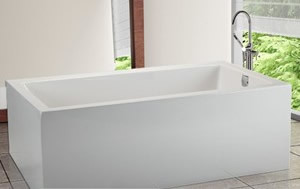 MTI has developed a process for actually transforming any Andrea drop-in / undermount tub into a freestanding tub! It is an amazing process that is painstakingly detailed and all done by hand by the craftsmen at MTI. The result is a Sculpted Finish. The tub is seamless and looks as if it were hand-molded out of a single piece of material. 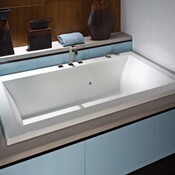 Andrea tubs in MTI’s Sculpted Finish make great soaking tubs, but they are also available as air baths. Available only in white, Andrea tubs with MTI’s Sculpted Finish can also be ordered finished on one, two or three sides to accommodate various applications. And if necessary, an access panel can be provided. Like all products in MTI’s Designer Series, Andrea tubs with Sculpted Finish are made in the USA and handcrafted in durable high-gloss Lucite cast acrylic. Love the contemporary design but long for armrests? Armrests option is offered on most of the Andrea tubs. Along with the armrest option, a Removable Teak Seat provides a resting place when bathing or hand showering. Sleek, low-profile integrated overflow. Measures only 6.5" wide by 1" tall. Allows for overflow to be positioned higher than conventional types for a deeper soak. Overflow is factory-installed and available for specific Designer & Classic Series tubs only. Available in chrome, brushed nickel or special finishes.